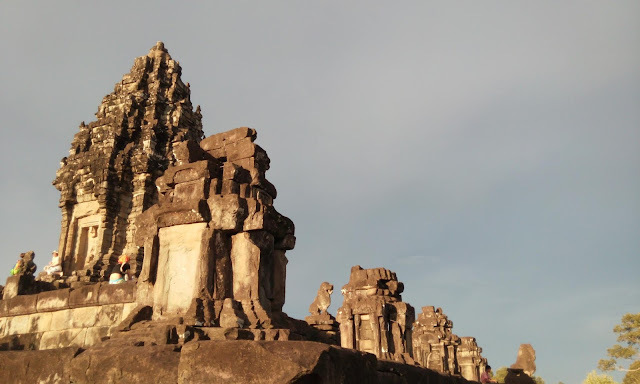 I wouldn't have dreamt of going to Siem Reap had it not been for a friend who insisted that we go there but for some unforseen reason, she wasn't able to make the trip. But I and another friend had the best time in Siem Reap. 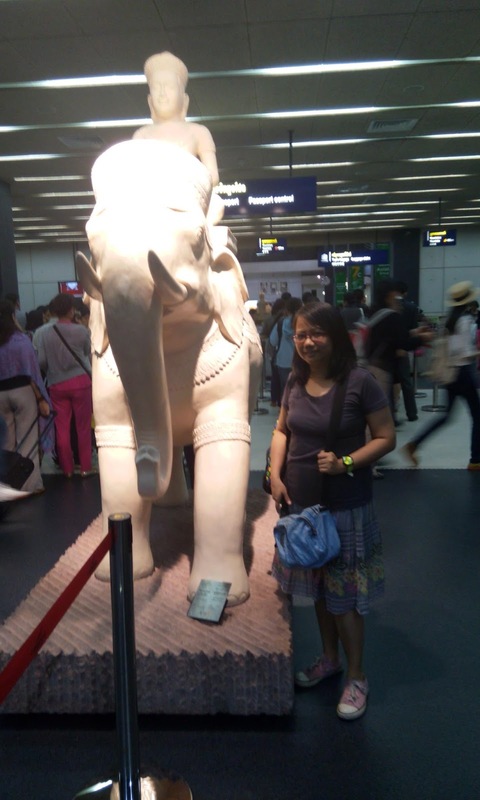 Of course, prior to our trip, I did a lot of research about the place especially the temples and the famous Angkor Wat. It was almost midnight when our plane landed at Siem Reap International Airport but we were giddy with excitement (hence the blurry photo). For Asia passport holder, it is quite easy to zoom past immigration and you don't have to pay anything. Don't follow the line where there are Caucasians because they are required to pay some $$$. Rithy Rine Hotel. We pre-booked our hotel and it includes tuk-tuk pick-up from the airport. 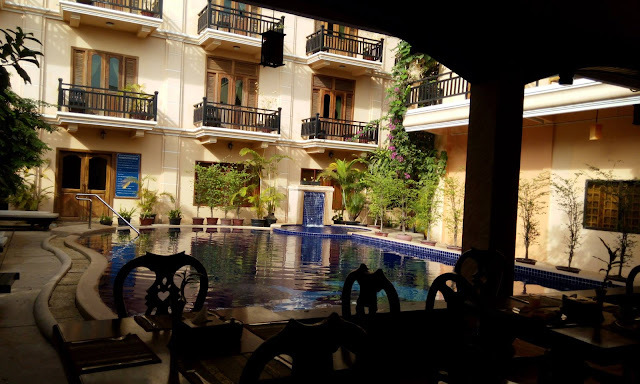 We weren't able to explore the hotel until the following morning though since it was almost 11pm in Siem Reap when we arrived. You can read more about Rithy Rine Hotel. 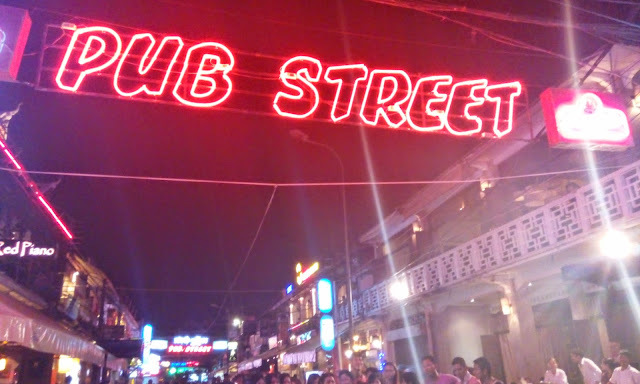 Pub Street is similar to our Burgos District in Makati City. This is where most of the tourist hang out at night and drink beer and eat, and enjoy some shopping and massages. If you are visiting Angkor Wat, it is advised to get your ticket at 5 in the afternoon since you will be given an extra free hour (5-6pm) to tour the temple grounds. In our case however, our plan got dampen by the rain. 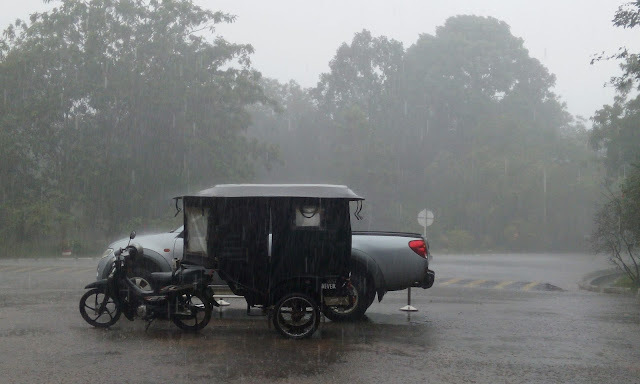 Btw, unless you have check-in baggage, you can bring your own umbrella. In our case, we just have hand carry luggage with us so we opted to buy an umbrella at the Japan Home. Wat Tmei (Thmey) Temple (Killing Field), new name Wat Adthekaram. And because we weren't able to go to Angkor Wat when we bought our tickets, we just told our tuk-tuk driver to bring us to Wat Tmei temple which we happen to pass by on our way to the ticket office. This temple used to be a "killing field" area. For those not familiar with the history of Cambodia, the darkest time was when the country was controlled by the Khmer Rouge and there was a mass persecution. 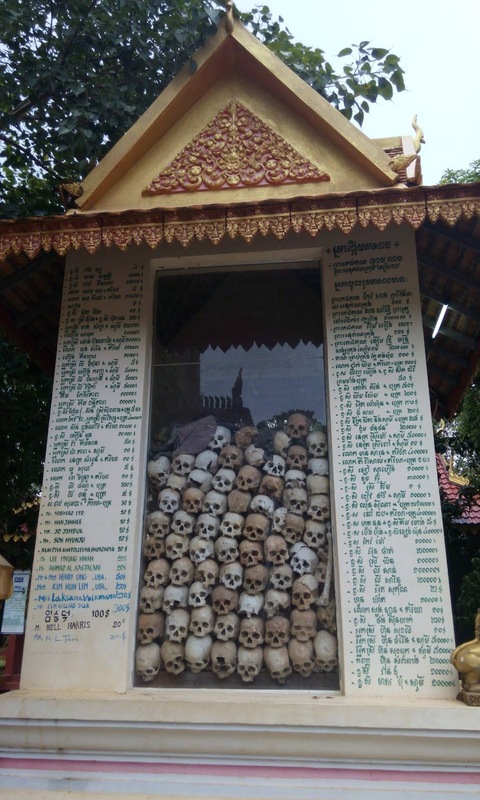 Some of the collected bones from the killing field are housed in a shrine inside the temple. Young monk at Wat Tmei. Wat Tmei is not just a temple, it is also a school for young monks. 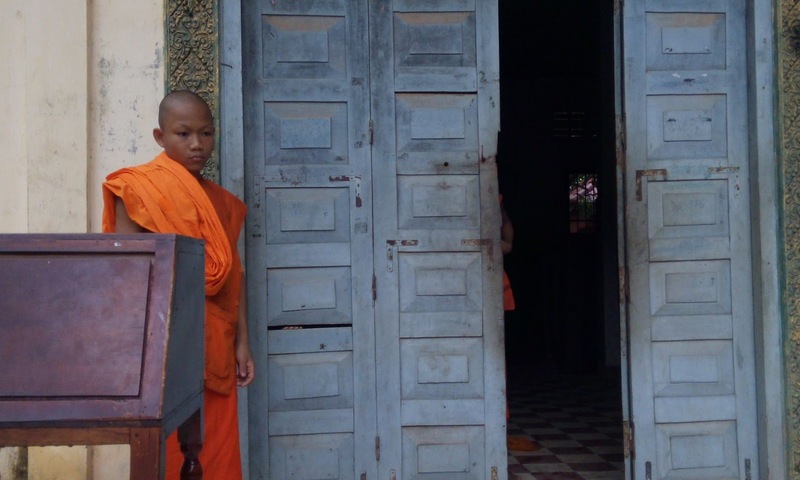 Actually, some family in Cambodia entrusts their sons in temples to study or become monks. This is because they know that their sons won't go hungry in the temples. Angkor Wat. Traveling to Siem Reap is not complete if you won't visit the ruins at Angkor Wat and other temples. 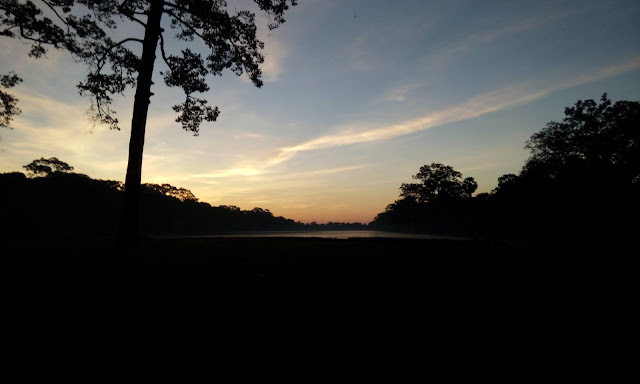 This was my first glimpse of how vast Angkor Wat is. Going there and exploring the temples really took my breath away. Here are some of the temples I've visited: Angkor Wat, Ta Prohm Temple, Ta Nei, and Angkor Thom and Bayon. Ta Prohm. This is the most popular and world famous temple in Siem Reap thanks to Angelina Jolie's Tomb Raider movie. My friend and I did out own temple run. The trees inside Ta Prohm are really huge so when the temple was deserted, the trees took over. Bayon Temple. This is another popular site for tourists. 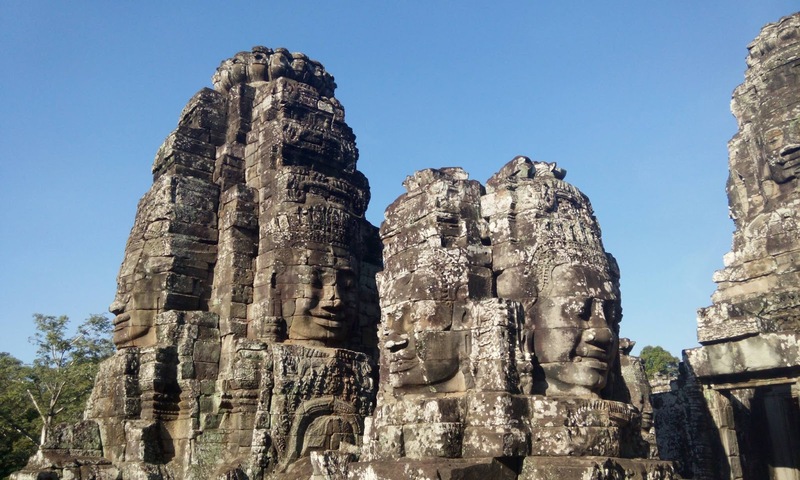 Bayon is known for its many faces. 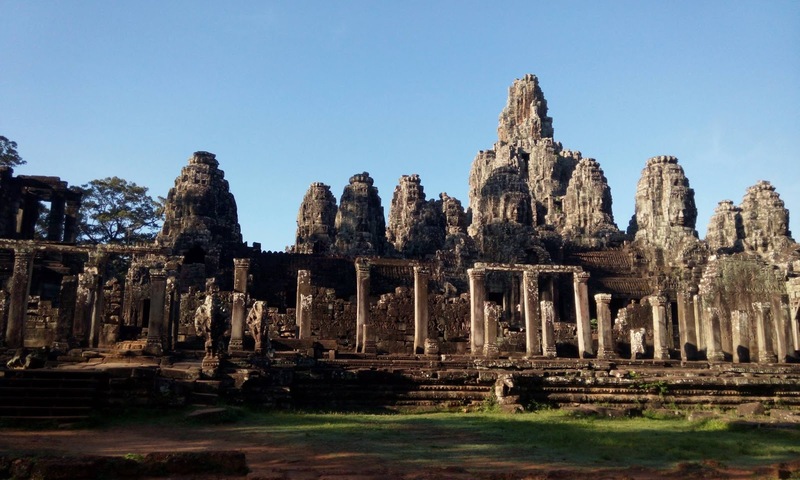 The photo below is just a part of Bayon Temple. It is a huge area and if you plan to check the whole temple, you have to allot a few hours to be able to cover the whole area. The Terrace of the Elephants. This is near Bayon Temple. However, near doesn't mean that it is a short walking distance. What's amazing here is that during the ancient times, elephants was really a revered animal. 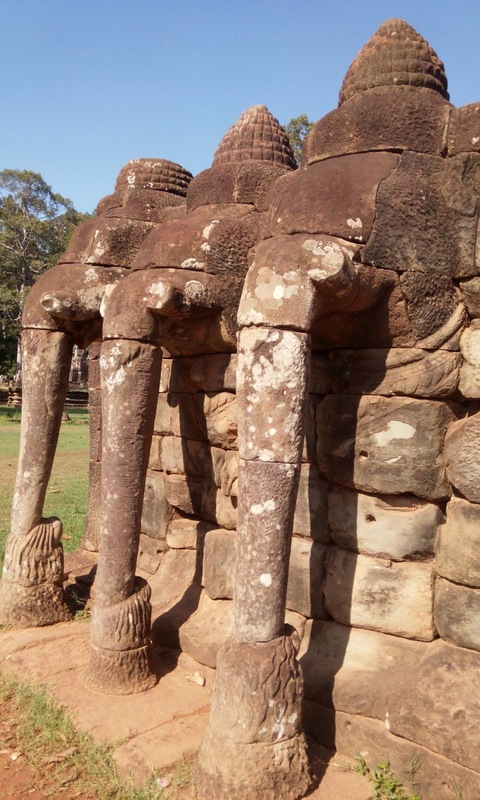 Pre Rup Temple. This temple is not within the Angkor Wat temple area. We traveled to a different location in the city before we reached Pre Rup Temple. This is not a popular tourist destination so there's only a handful of tourists when we arrived. The "lion" figures on top of the temple are the highlights here. Apsara Dance Performance. Going to Siem Reap is not complete if you haven't seen an actual Apsara Dance Performance. 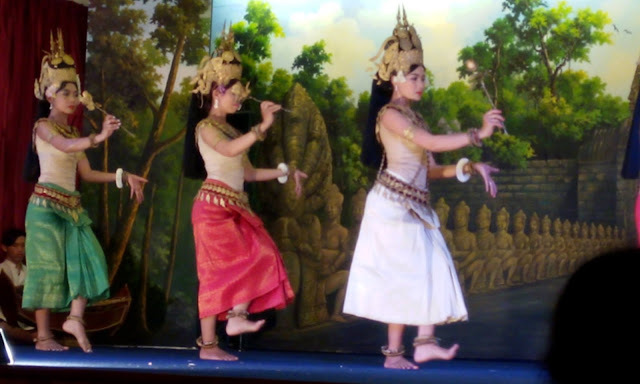 The dance steps are somewhat similar to our "singkil," except that Apsara is slower and doesn't have bamboo poles. 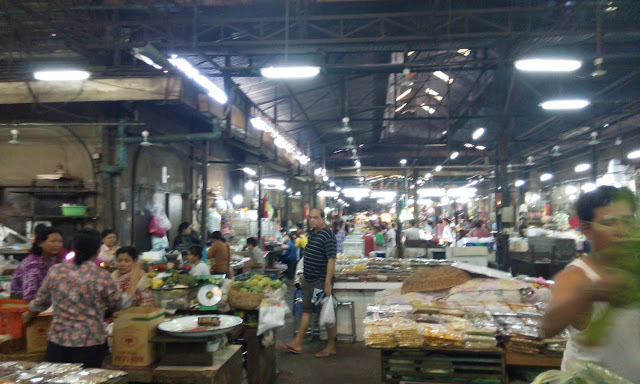 Phsar Chas or Old Market. This is where tourist go to buy souvenirs. The items are cheap, and you can also buy fruits and a lot of spices here. We bought Kampot pepper, kaffir leaves, lotus seeds, etc. 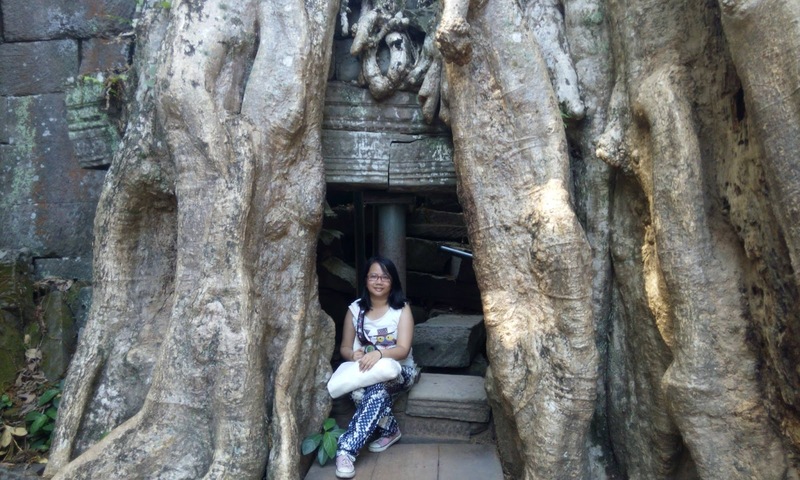 Overall, I love Siem Reap especially the temples. I dreamt of going back to visit the place again and do another round of temple run. Let's travel to Siem Reap soon! Looks like a good trip to Siem Reap. I'm surprised how similar many things look to my adopted country, Indonesia. The ancient temples and carvings look absolutely wonderful! I haven't been to Indonesia but would love to visit the country soon, especially Yogyakarta. Lost in Siem Reap, just read your impressive post with great pics, enjoyed lot.